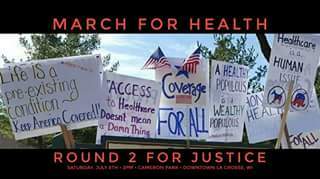 Just a reminder that today from 2 to 4 is the March for Health - Round 2 for Justice at Cameron Park. Please attend if you can! Also, a Badgercare For All bill, authored by State Representative Eric Genrich (D-Green Bay) and State Senator LaTonya Johnson (D-Milwaukee), has been introduced in the Wisconsin Legislature. Citizen Action of Wisconsin, who has been working on this issue for a long time and helped work on the bill, held a State Capitol press conference with leading legislative Democrats to announce the new bill. According to Citizen Action, "The proposal will offer better health insurance with a wider choice of doctors and hospitals for an average of 23% less than corporate insurance. The bill demonstrates that we can dramatically reduce health care costs and increase choice if we use the positive power of our own democratic government in the public interest. It stands in stark contrast to the plans proposed by Congressional Republicans which take health care away from tens of millions of people to fund tax giveaways to the wealthiest Americans." Citizen Action is about half way toward its goal of signing up 240 Healthcare for All co-op members who would commit to donating $20 per month to hire a full time healthcare for all organizer in our state. Anyone may join. See their website for details. Meanwhile, the Washington Post is reporting that the White House and Senate are planning a "final urgen blitz to pass health-care law." Senate majority leader, Mitch McConnell has said that if a Republican-only bill fails, the Republicans will have to, "... work with Democrats," to shore up the ACA healthcare market.